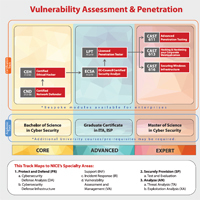 This guide will help you understand what Cyber Security certifications are available by Security Focus Area, Job Role, Intended Audience, as well as some example companies who currently build capability in their Cyber Security teams with EC-Council certifications. EC-Council's Certified Security Analyst program is a highly interactive security class designed to teach Security Professionals the advanced uses of the methodologies, tools and techniques required to perform comprehensive information security tests. Students will learn how to design, secure and test networks to protect your organization from the threats hackers and crackers pose. By teaching the tools and ground breaking techniques for security and penetration testing, this class will help you perform the intensive assessments required to effectively identify and mitigate risks to the security of your infrastructure. As students learn to identify security problems, they also learn how to avoid and eliminate them, with the class providing complete coverage of analysis and network security-testing topics. CED Solutions is your best choice for CISSP CEH ECSA, CISSP CEH ECSA training, CISSP CEH ECSA certification, CISSP CEH ECSA boot camp, CISSP CEH ECSA certification training, CISSP CEH ECSA certification course, CISSP CEH ECSA course, CISSP CEH ECSA class.